It’s shocking to think that compared to Europe, new build homes here in Britain are the smallest. And no I haven’t made this up in the hope that you’ll read today’s post. This is an actual fact from the Royal Institute of British Architects (RIBA), and a Cambridge University study backs this finding too. Putting Britain’s shrinking house sizes into context, RIBA also reported that the average one bedroom flat is now the same size as a London Underground tube carriage! On a positive note, I did discover that Holland has a whopping 137 sq m floor space, compared to us Brits, with an average of 77 sq m. Thinking about packing your bags and moving? 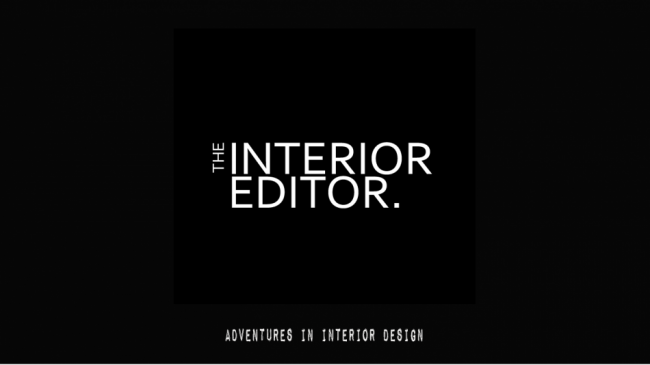 If that’s not an option, then today’s post might just help in making the most out of the spaces you do have. 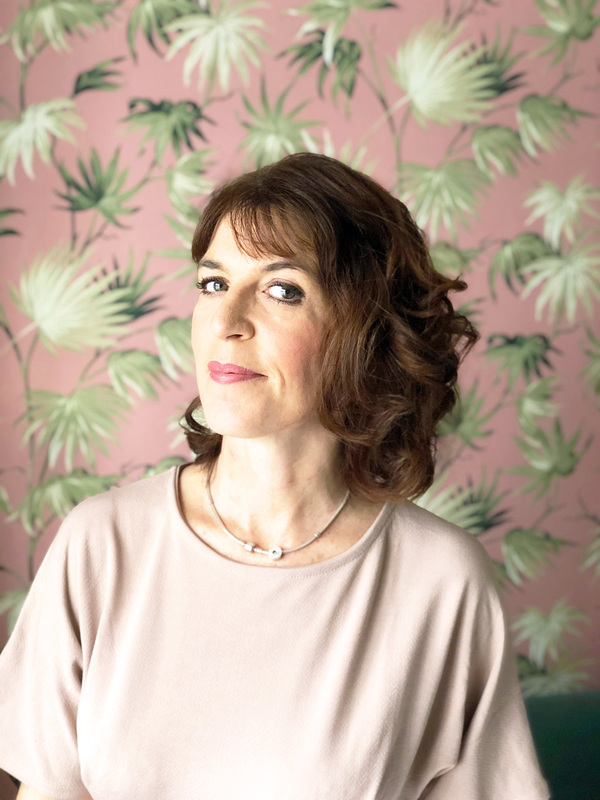 Here are my #5 Steps to Create the Illusion of Space that you can prevent your homes from feeling small and oppressive. A space that is devoid of furniture and furnishings always appears larger, but as soon as you place solid objects such as furniture into it, the less of the room you see, and the smaller it feels. This is where choosing the right materials can have a massive impact on small spaces. The kitchen above has chosen materials that really enhance, and make it appear larger than it actually is. The use of transparent materials such as glass and acrylic allow our vision to see further, and more of a space. 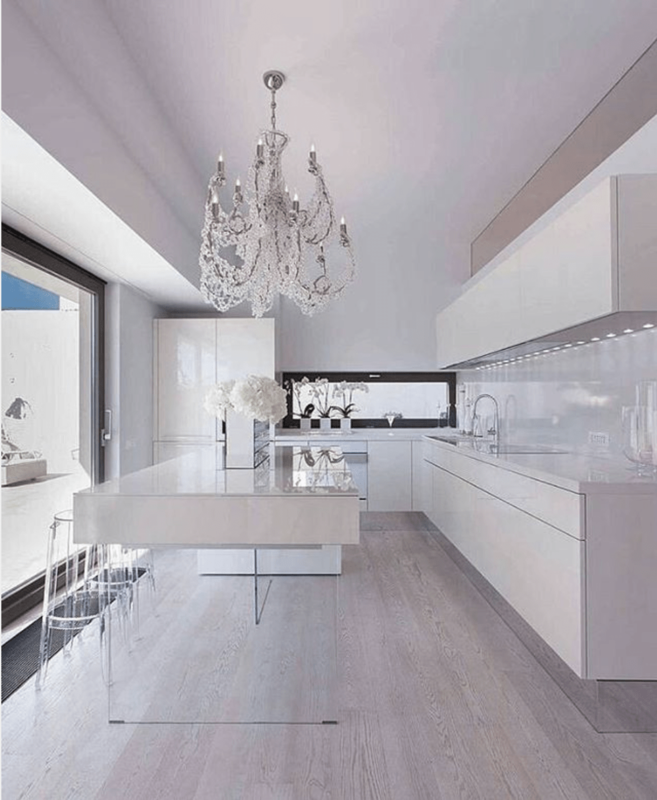 The above glass kitchen island appears to float, and in return, we see more floor and further into the room. If this had been a solid wooden island, it would be the same space, but it would instantly feel smaller with a solid mass placed in the centre of this room. Reflective surfaces are brilliant at reflecting light back into a room, and here they’ve used mirrored kickboards, and high gloss units to do just that. Although, I’m not sure about the practicality of the mirrored kickboards. In essence, the more light that is bounced around a room, the lighter and larger it will feel. 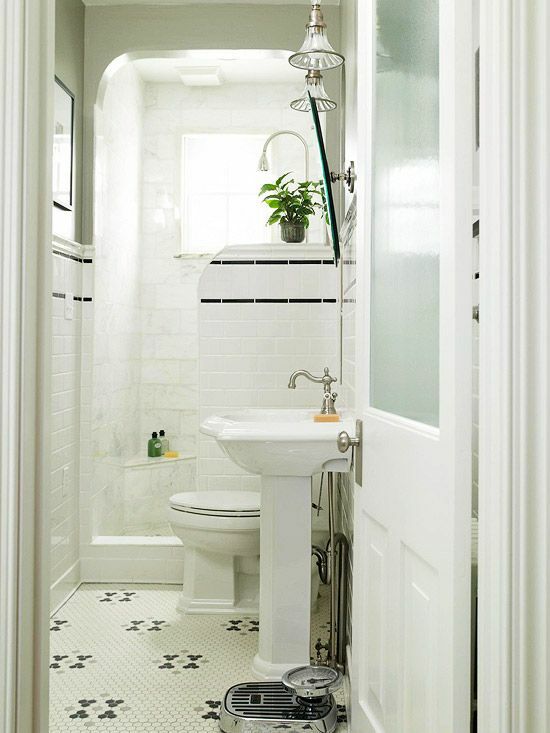 Using larger tiles can help make a small space feel larger. 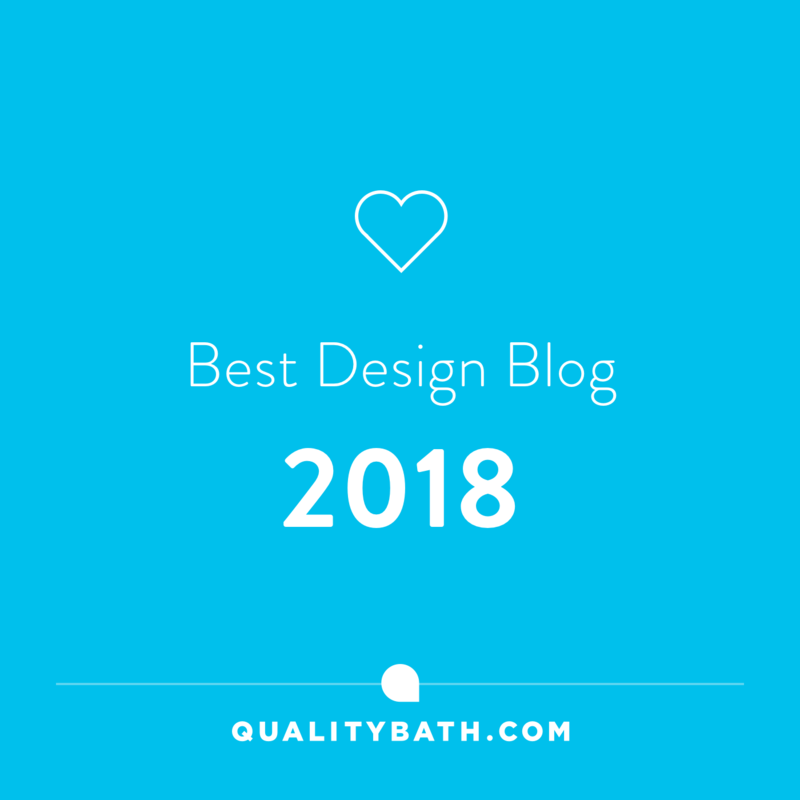 The main reason behind this is that there are fewer grout lines breaking up the floor, and therefore, your brain is tricked into thinking the space is larger than it is. Flooring placed on the diagonal, especially in narrow spaces, can intensify the illusion of space, and make it look wider. If you opt for hardwood flooring go for a wider plank like the space above. Using the same principle as larger tiles, the fewer grooves you see, the less the floor is broken up, and the illusion of space is greater. 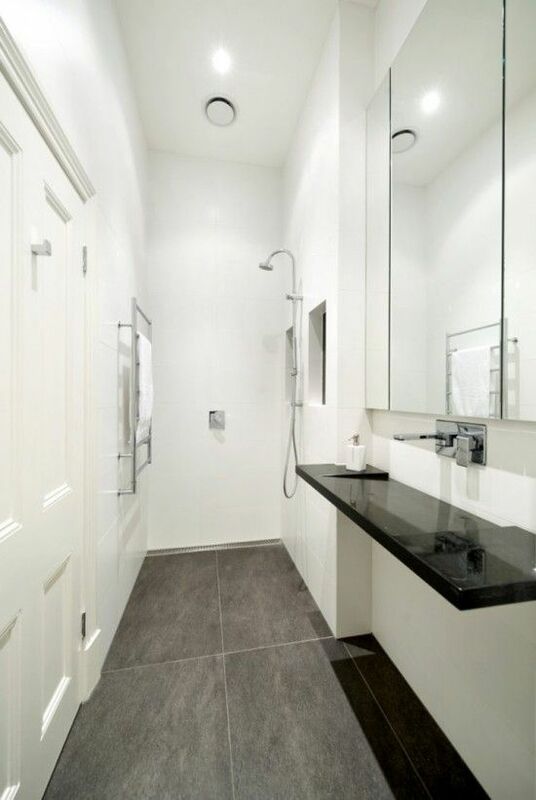 Very small tiles such as mosaics are also great for making very small spaces appear larger too. Because your eyes see so many tiles and intersecting grout lines, we are visually distracted by the pattern, and we think a space is larger than it actually is. Take down the drapes, and go for blinds, shutters or voiles instead. These allow more natural light to enter into a room making it feel light and airy. If you must have curtains, make sure they are a similar colour to your walls so they blend in with their surroundings. Oh, and hang the curtain rod higher, nearer the ceiling, to make the room feel taller. These days with central heating and double glazing, the need for heavily lined curtains isn’t really a necessity. They do, however, create an air of luxury to a space, just make sure the room is big enough to use them as they will limit the amount of natural light coming into a room and take up vital wall space. Yep, I know today’s post says #5 Steps to Create the Illusion of Space. Think of this Step as your supermarket offer of Buy (Read) One Get Two Free. Make the most of the vertical in your small spaces by way of bespoke/fitted furniture pieces. They not only make good use of wall space, but they also help draw the eye upwards. Adding a sense of height to a room can make a huge difference to small spaces. Most of us know that using neutral/light colours can enhance and make a space look larger. However, colour can be used as a distraction, as well as a visual tool, when it comes to small space living. 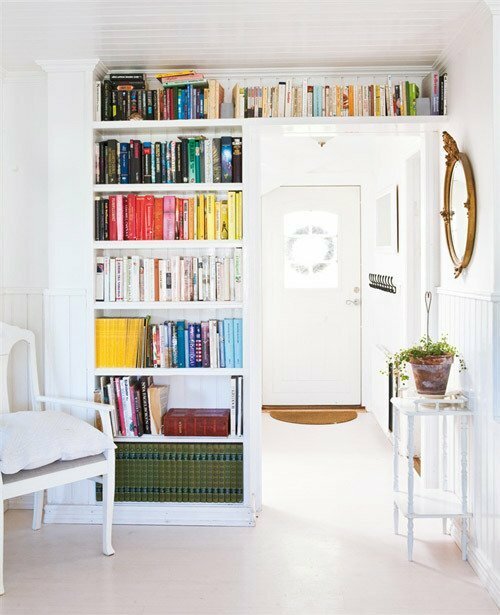 The brightly coloured books in the above space, visually draw the eye upwards, and beyond our normal mid height visual range towards the ceiling. Removing physical obstacles such as doors can help open up the smallest of rooms. I’m not suggesting you remove the bathroom door. Instead look at removing doors to adjoining rooms to prevent there being a visual barrier. By doing this, you can create a feeling of openness. The hall above blends into the connecting room as they have removed the door. Oh, and it also helps to paint connecting rooms the same colour. Yep an obvious one, but it is an easy one to oversee as we tend to accumulate stuff and before we know it, it can take over our living spaces. The trick in small space living is ensuring that you create as much storage as possible. The more cluttered a space, the smaller it will feel. Whether you have done the Marie Kondo decluttering to death, or not, we all have belongings that spark joy. 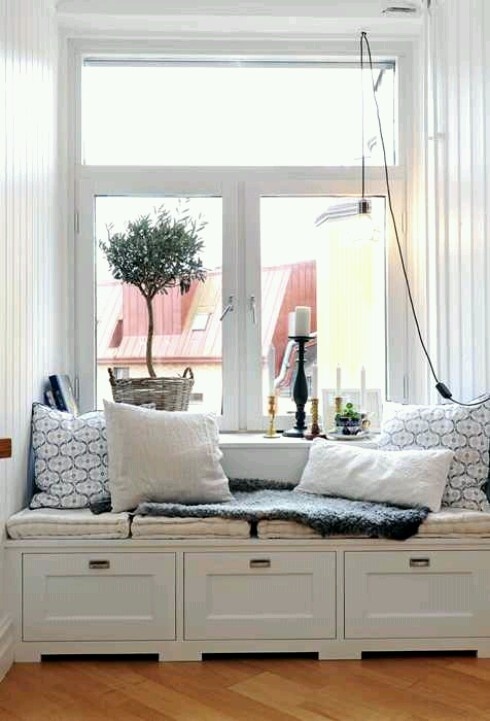 Apart from the obvious furniture solutions such as wardrobes, and shelving, look to finding areas in your spaces that you can create storage such as window seats that double up as discrete storage like the one above. 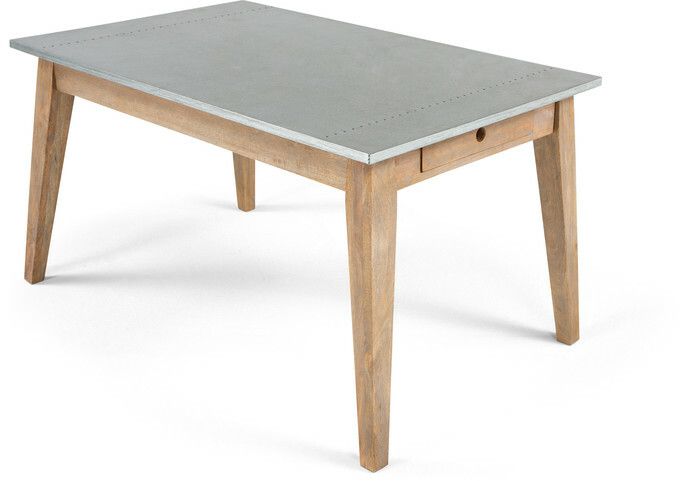 Even the smallest amount of storage built into furniture such as this zinc table from Made.com will help keep clutter at bay. Lastly, I wanted to end with an example of small space positivity. 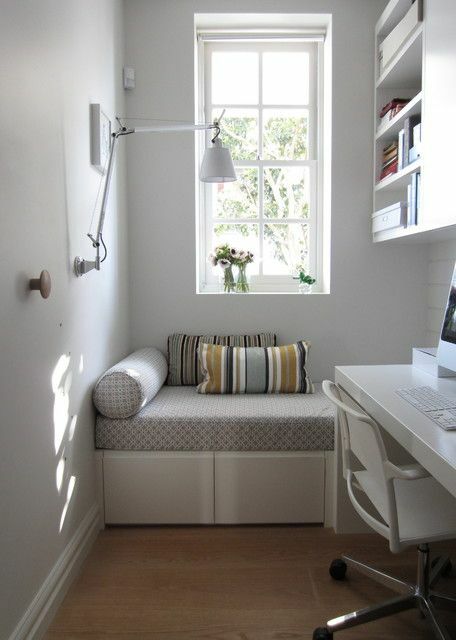 The above space demonstrates that you can create functionality even out of the smallest of spaces. 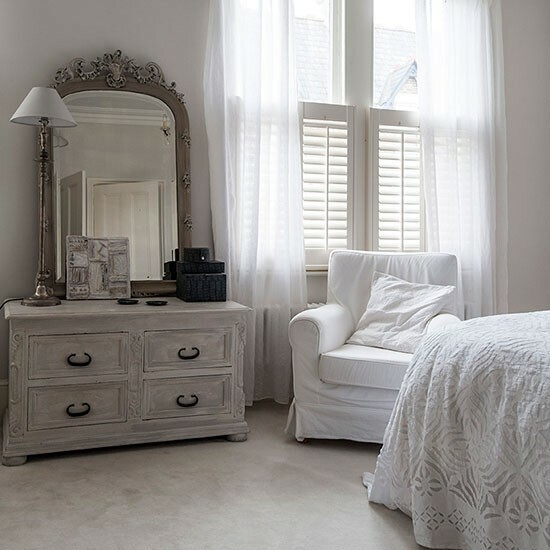 We have all seen this type of room depicted as being the 3rd or 4th bedroom on the estate agents details but isn’t actually big enough to swing a cat in, let alone a bed. The tiny space above has been utilised as a home office space to great effect, and here’s how…..
Soft light dove grey colour applied to walls creates an airy feel. Pop of colour with the cushions, aids as a distraction and creates interest to stop it from looking bland/boring. Windows have been left devoid of curtains/blinds ensuring as much natural light enters the space. Discrete storage beneath the bespoke seating area. Floating glass shelves and desk ensures we can see more of the floor, making it feel larger. I hope you’ve found today’s post helpful especially if you are struggling with small space living. Please do leave any comments, good or bad, as feedback is always helpful. Thanks for stopping by and taking time to read today’s post, I am always truly grateful. Have a great week! !